Posted in Book Reviews | Memoir. Every now and then you pick up a book and begin to read it – and you just want to keep on reading. It’s not something I’d normally say about a literary memoir. Far from it. And to be honest, ‘Friends With The Enemy’ is not a book everybody would immediately pick off the shelf. But this is one book I’m delighted I did. 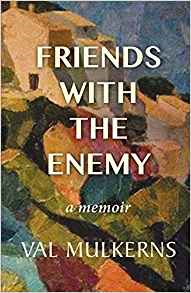 True to this description, the style in ‘Friends With The Enemy’ is finely crafted, entertaining and – for lack of a better turn of phrase – a really mellow kind of read. That’s such a bonus in a memoir. There are far too many grubby confessionals out there these days packed full of gory details that nobody wants to hear about, thank you. Or at least I don’t. Val Mulkerns starts the book with early memories. Her father was an impassioned rebel in the 1916 Easter Rising who fought at the Four Courts and was dispatched to the dreaded Frongoch Prison Camp in Wales for his efforts. Her mother is a strong, vibrant character in the book, and the tragedy of her early death is felt all the more by the discreet description of the loss. Like many young women of her day, Val Mulkerns left Ireland just after the World War II and found work as a teacher. But after her first novel was published in 1952, she accepted her life’s calling and went on to write novels, short stories, and children’s books. You’d imagine, at this point, that anybody publishing for the best part of six decades might fall into the trap of literary name-dropping or pontificating about the state of Irish letters. But no. Not at all. Val Mulkerns avoids such pitfalls and shares with us precious memories of Dublin as a city in the twentieth century, of writers and friends in the arts, of travels and loves, and starting a family in the late 1950s. Happily, it’s not a book that follows each stage of the author’s life in chronological fashion. The overall impression I came away with was a book full of summers. Val Mulkerns has the most wonderful turn of phrase when it comes to describing sunlight, or heat haze over a long-ago seaside outing, or a trek through Tuscany’s historical sites. She selects those parts of her life that she likes to write about, and writes about them beautifully. She constantly quotes the classics of literature, but doesn’t wallop you over the head with them like a mallet, more just using them as reference points in her life, which would make sense, for a writer. I could say it’s a writer’s book, but I won’t, because it’s a fine read that anyone will enjoy. Go on. Treat yourself. You know it makes sense. Caren Kennedy is currently studying for an MA in Writing for Screen and Television in the National Film School at the Institute of Art, Design & Technology (IADT) Dún Laoghaire. For more, click here. Order your copy of Friends With the Enemy here.